Could one of your relations have died after 1856 and be buried in the Milton Road Cemetery in Weston-super-Mare? This is a most valuable finding aid and is the result of many hours of work by members of the Society and it incorporates Life Member Brian Austin’s earlier survey of Memorials, many of which are no longer readable. H 115, Dedicated as a token of gratitude by past and present members of Lewisham School to the beloved memory of their Headmaster LEONARD CHARLES COMFORT, who died March 11th 1931, aged 57. ‘He asked life of thee, and thou gavest it him’. And to the memory of LILLIAN ANSTICE, his wife, died December 5th 1955. As a result of the Burial Act in the early 1850s, Weston was given permission to open a Municipal Cemetery and at the same time the existing Burial Grounds at St John’s and Emmanuel were closed to new burials. 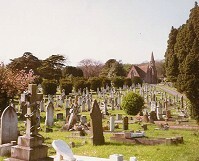 The Cemetery is now run by Weston-super-Mare Town Council.